Date Night continues our 31st wedding anniversary celebration with another special meal. Why go out once for your anniversary when you can go out twice? 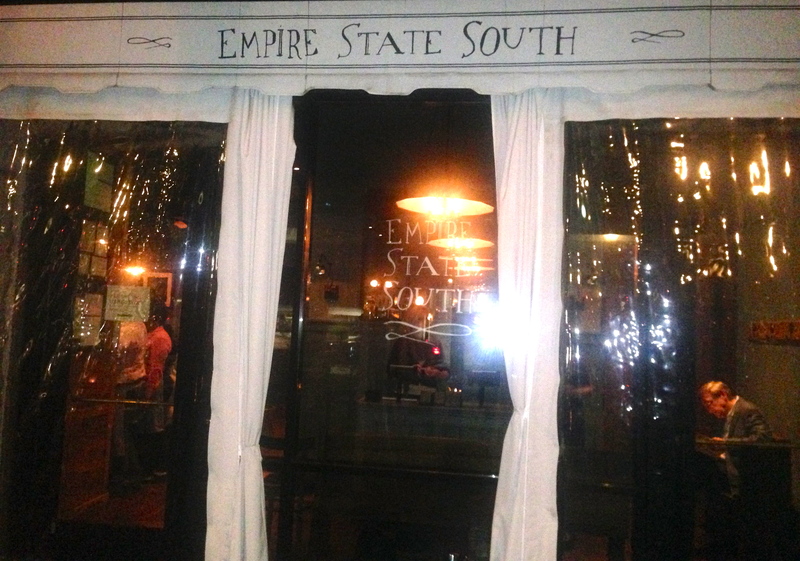 We have been eagerly awaiting our date at Empire State South. It’s located in a big high-rise in Midtown with free parking behind the building. We made our reservation six weeks ago, and we are anticipating a good meal from the menu of celebrity Chef Hugh Acheson (Top Chef). 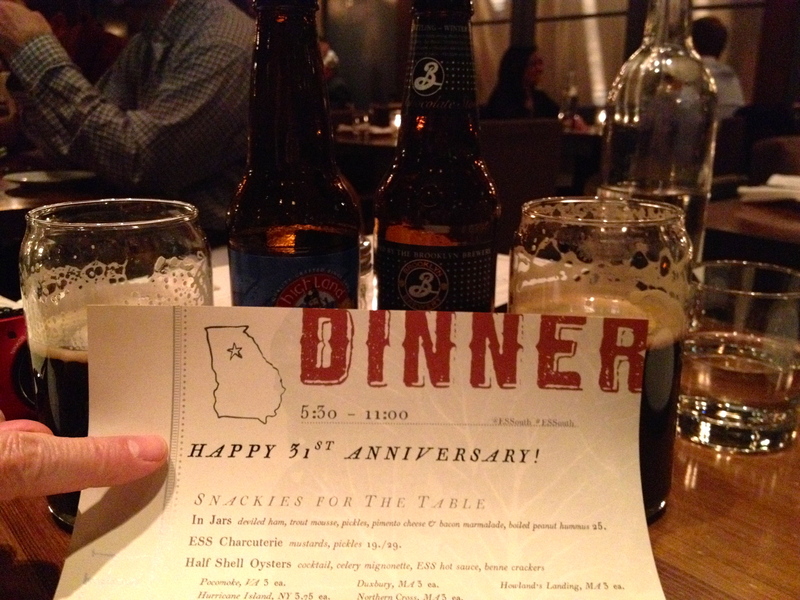 We have already visited and thoroughly enjoyed both of Acheson’s restaurants in Athens, Five and Ten (Date Night, 4/20/12) and The National (Date Night 4/19/13). This will complete our “Acheson trifecta”, although we hear he has opened another place in Athens that we will try soon. The entrance is all winter-proofed to keep everyone warm inside. There is a bocci ball court right outside of the restaurant which looks like it would be fun to kill some time on a warm day. We are greeted by a friendly woman who shows us to our table and presents us with something special. Does it really say “Happy 31st Anniversary” on our menu? Does everyone’s menu say that, or just ours? We look at other menus, and it looks like we get two that are printed just for us. We already like the place, and we haven’t eaten a bite. 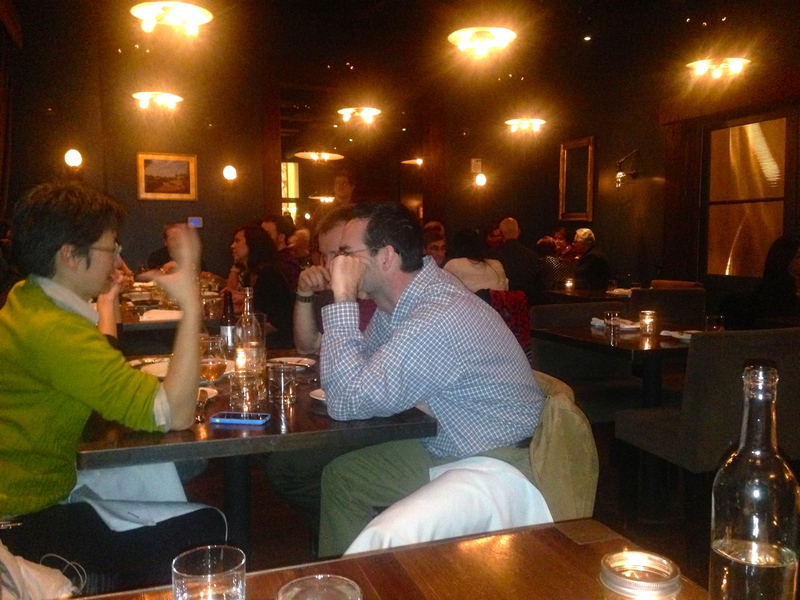 We have a really good corner table too, with a view of the entire restaurant. It’s nice to get this prime real estate. We think beer is special and we order two good ones. 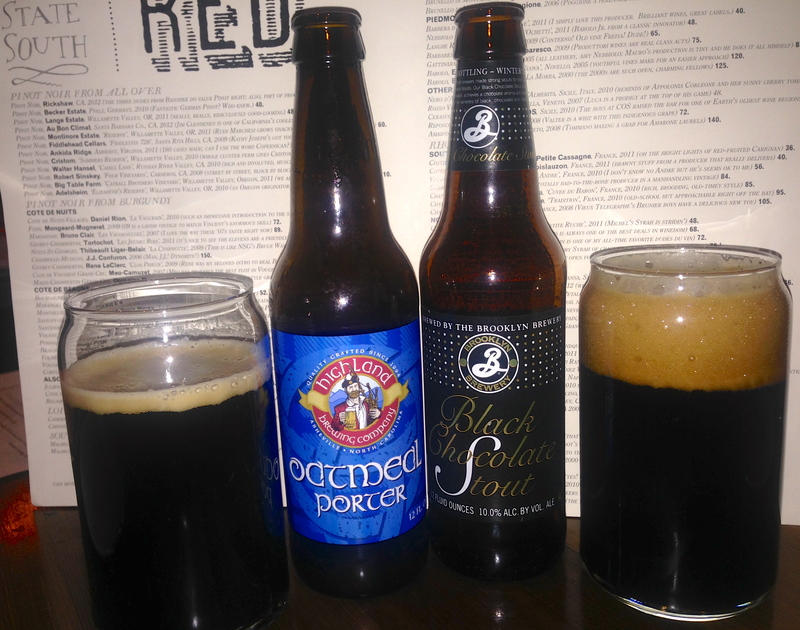 The Brooklyn Chocolate Stout is a good winter beer, tasting of mocha and chocolate. The Highland Oatmeal Porter is a bit hoppy for a porter, but it’s a good beer for the food ahead. The menu is new-wave southern with snacks, small plates and entrees. Foodie friends want us to try the snacks in a jar, but we are disappointed to learn that you must order all five jars ($25) and it’s meant for at least four people. The anniversary girl is bummed that we can’t order one or two of the jars instead of all five. There will be no snack jars on our table. However, the appetizer we choose might be one of the best we have ever had. The farm egg is recommended by our server Janise and we strongly suggest you try it if you eat here. 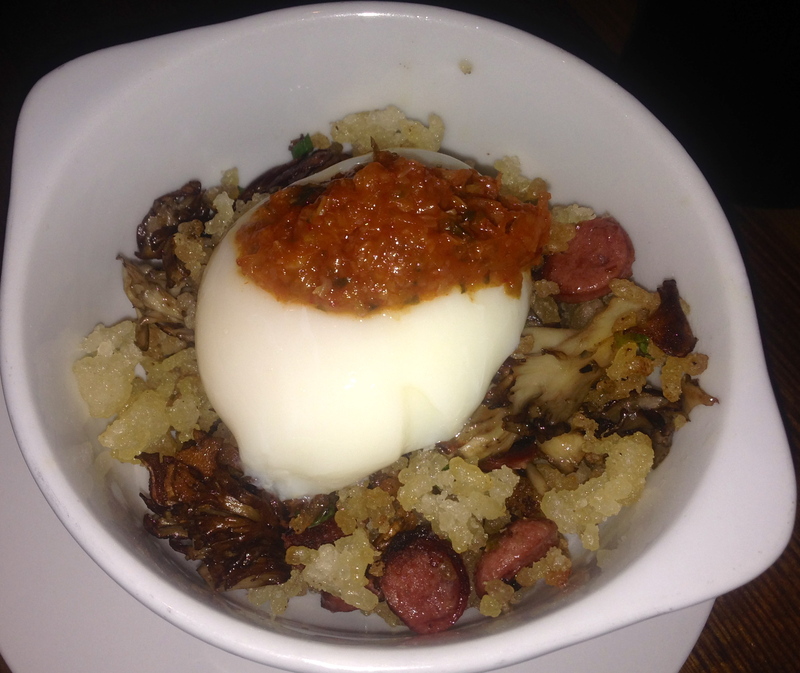 It’s an egg over crispy fried rice with mushrooms and hot dog. We are told to break the egg over the dish and then mix it up. Wow. What an incredible combination of flavors and textures. You have the crisp of the rice with the soft, gooey egg combined with the chewy mushrooms and hot dog. Amazing. One server tells me that this dish is what keeps people coming back to the restaurant. We agree. We would go back just to have this again. There are five entrees on the menu. We try two of them. 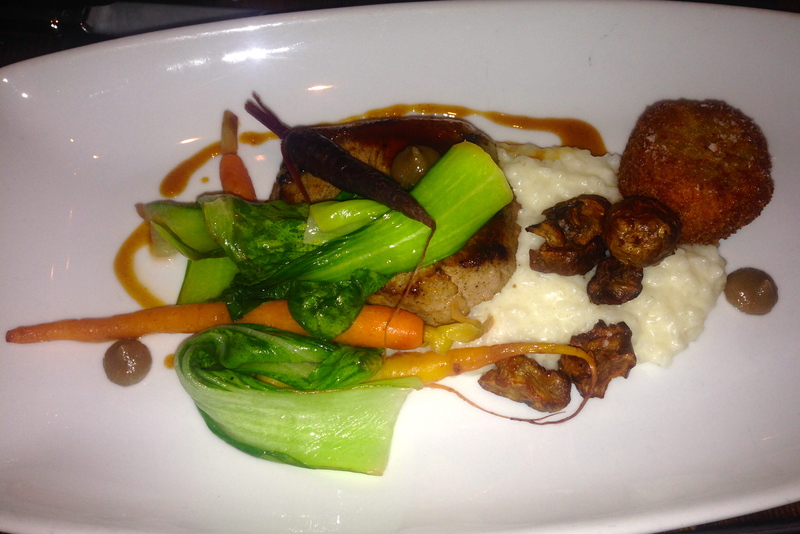 The tender pork loin comes with a nice presentation of carrots, sunchokes, boo choy and grits. It also comes with a head fritter. A head fritter? It’s the head meat of a pig that’s cooked and then fried. It’s actually very good–think pulled pork that’s then fried. We just think it needs a better name. Our second entree is the prime ribeye. It’s cut into small pieces and comes with some short rib as well. The meat is tender and gorgeous. It’s delicious, but expensive at $38 for the portion size. Because we are celebrating tonight, you know we are going to have dessert. This is called “cocoa and faro”, which is bread pudding with toffee sauce and coffee toffee along with a small scoop of malted milk ice cream. 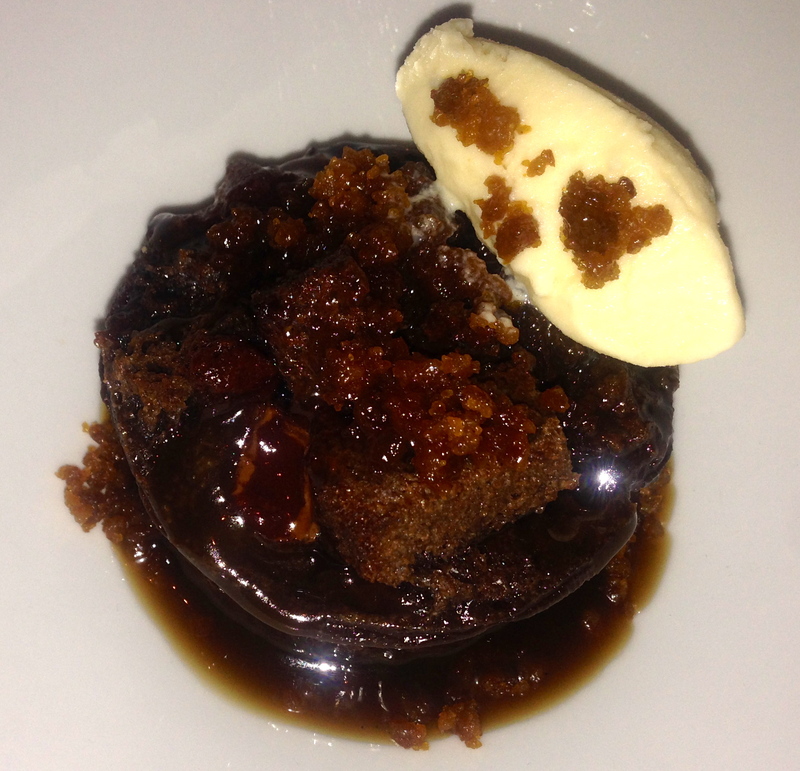 The bread pudding is wonderful, but the toffee sticks to our teeth and makes it hard to eat. Don’t order this if you need dental work. The bottom line on Empire State South: It’s expensive, but a nice place to go for special occasions like your anniversary or birthday. Our guess is that if you tell them you are celebrating something special, they will make a unique menu just for you too. 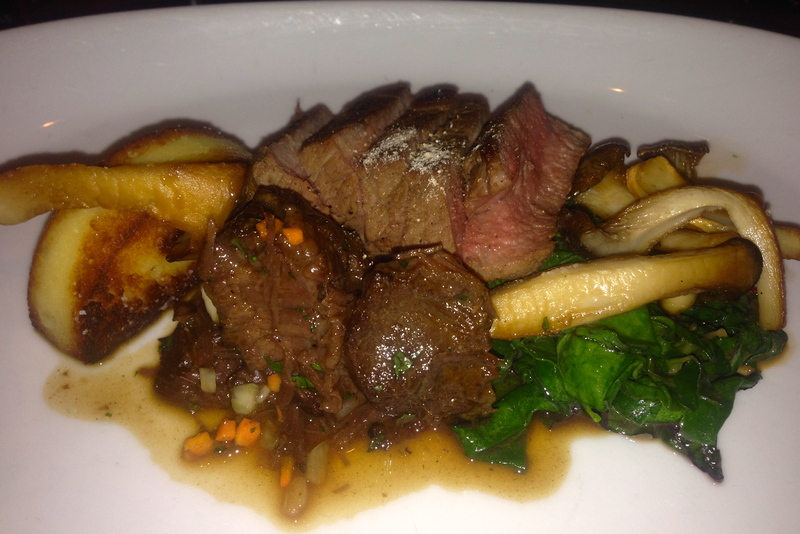 Everything we ate was excellent, prepared with extremely fresh ingredients. The portions are not huge, but the prices tend to be. Be prepared to share your food with your date, not split it.